Call them spring rolls, summer rolls, salad rolls, fresh rolls - the common denominator is that we’re certain these are the only kind of ‘rolls’ you’ll want for summer. This easy-to-make recipe, bursting with flavour, can be served as a side at a sunny BBQ, or enjoyed as a full meal on their own. The cost to make them at home is a fraction of what you’d pay in a restaurant or grocery store - plus you can add in whatever ingredients you'd like! I choose to order nearly all the items below directly to my doorstep from Vitasave.ca. With options for free shipping across Canada and a commitment to make healthy living easy and affordable for everyone. Take a rice paper and dip it into warm water, immediately pull it out of the water, letting it drip off for a second before placing it onto a clean surface with a bit of grip (a cutting board works great). 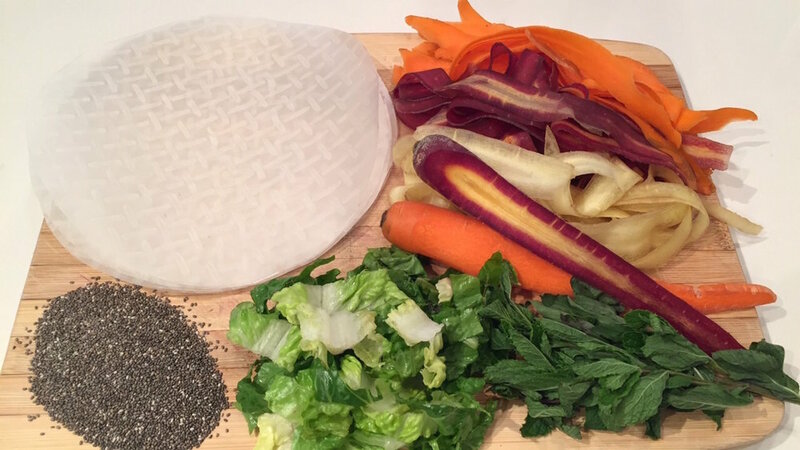 Lay carrots side by side in the center of the rice paper. This is where the color will come from. Layer lettuce, mint, thai basil, hemp and chia seeds on top. Pull up the bottom of the rice paper wrapper like you would to wrap a burrito, tucking the sides, and meeting at the top edge. *Note: use the first roll as an experiment (and the one you eat), seeing as it likely won’t be your prettiest! Cut in half with a sharp knife and serve with the Lemon Garlic Tahini sauce. Add tahini, avocado oil, Flavorgod lemon & garlic, and a squeeze of lemon into a small mixing bowl, combine together. Add water a little at a time, continuing to whisk, until you have a creamy sauce. Taste and adjust seasonings as needed. If you have any leftover sauce it can be kept in the fridge for 1-2 weeks. It’s delicious on salads, falafel, veggie burgers, and much more!